The first trading week of 2017 sure was busy for me. Throughout the first week I had a total of 14 different option moves. Last week, I covered all of the ones that were closed during the first week. Now it's time to go over the 5 options opened last week that are currently still open. 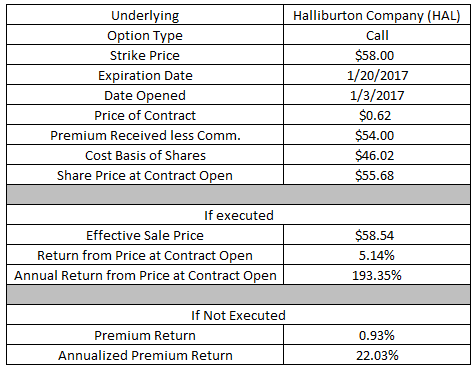 I typically prefer to sell put options rather than call options; however, with Halliburton I make an exception. As I'm sure you're aware I acquired these shares via the employee stock purchase plan while employed at Halliburton. I have to be a bit more conservative with selling call options on these shares because of the way that taxes are handled for shares purchased via an ESPP program. Essentially you need to make sure you turn a profit higher than the discount you received or you could be paying taxes on "income" you didn't actually receive since you suffered a "loss". For more information on ESPP taxation check out this post. If the share price of Halliburton stays below the $58.00 strike price then I'll keep the shares and the option premium would be pure profit. That would be a 0.93% return in about 2.5 weeks or 22.0% on an annualized basis. If the share price of Halliburton climbs above $58 then I'll have to sell 100 shares of Halliburton at that price. However, since I already received the option premium my effective sale price would be the strike price PLUS the option premium or $58.54. At the time the contract was written Halliburton's share price was trading at $55.68. That would be a solid 5.14% gain in about 2.5 weeks or 193.4% on an annualized basis. I currently have a put option on V.F. Corporation that is open and in the money with a strike price of $55. There's only about 2 weeks left until expiration so time will tell if that stays in the money. I decided to go back to V.F. Corporation once again and sell another put option this time with a much lower strike price. If V.F. Corporation's share price falls below $50 then I'll have to purchase 100 shares of VFC at the strike price. However, since I've already received the premium payment my purchase price would be reduced by the premium received lowering the purchase price to $48.95 which is 8.3% lower than the price that shares were trading at when the contract was opened. The valuation at that purchase price looks pretty good. For the most recent year, which ended 12/31/2016, shares would be trading at a 15.64x valuation based on the analyst estimates. On a forward basis analysts expect V.F. Corporation to earn $3.41 for the current year putting the valuation at just 14.35x. The yield on cost at that purchase price would be 3.43%. If V.F. Corporation remains above $50 then I'll just keep the option premium as profit. Based on the $5,000 of cash required to secure the put option that's a 2.10% return. On an annualized basis that's an 18.4% return. This one will likely need a bit of management since I currently have the $55 strike put option that expires on January 20th that's in the money. Should those shares be put to me then my plan would be to convert this put option into a covered strangle. A covered strangle is created by owning the underlying shares and selling both a covered call and put on the same company. This would effectively allow me to double up on the premium I could collect. As has been the theme of the last few months there's a few companies that I keep going back to by selling puts and buying them back at a profit. Such is the case with Stryker which I've already cycled through 2 put options with a total profit of $148. If Stryker's share price falls below $110 then I'll likely have to purchase 100 shares of Stryker at $110 a piece. Since I received the option premium of $119.95 that will reduce my purchase price to $108.80 which is approximately an 8.9% discount from the price Stryker was trading at when the contract was opened. I'd be happy to buy shares of Stryker Corporation below $110. At that price the trailing valuation, based on analyst estimates for 2016's earnings, would be 18.82x. Looking forward to the analyst estimate for 2017 of $6.40 the forward valuation would be 17.00x. The yield on cost based on the current dividend payout would be 1.56%. 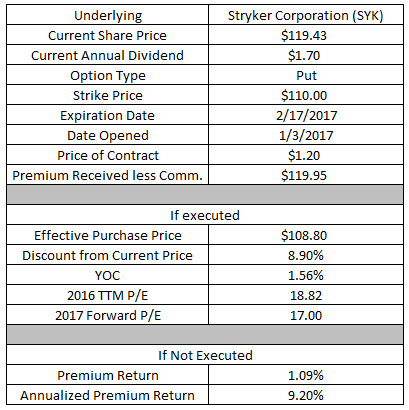 If Stryker's share price remains above $110 then I'll keep the $119.95 option premium as profit. Based on the $11,000 required to secure the put option that's a 1.09% return or 9.2% on an annualized basis. 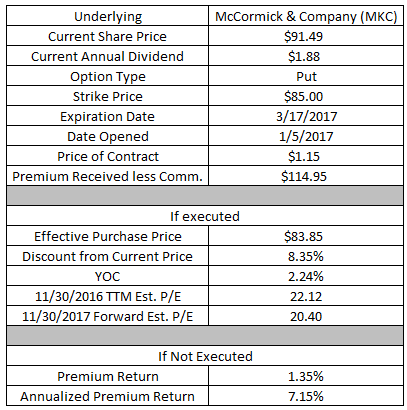 I've been eyeing McCormick & Company for several years now; however, it's never worked out where the valuation was acceptable while my investment capital was plentiful. It's still a bit expensive now around $91.50, but it's come down a bit and that's opened up some put option possibilities. If McCormick's share price falls below $85 then I'll have to purchase 100 shares at $85 a piece. Since I've received the option premium already my purchase price would be reduced by $114.95 lowering the per share cost basis to $83.85. That's around an 8.5% discount from where shares were trading at the time the contract was opened. That's a decent valuation to build a long term position at, but it isn't a wonderful one. McCormick's fiscal years end at the end of November and fiscal year 4Q 2016 earnings haven't been reported year. Based on the estimates for FY 2016 that would put the valuation at 22.1x. On a forward basis the valuation would be 20.4. The yield on cost at that purchase price would be 2.24%. If the share price stays above $85 then the $114.95 option premium will turn into pure profit. Based on the $8,500 in cash necessary to secure the contract that would represent a 1.35%. Even though this is a longer dated put option than I normally aim for that still represents a solid 7.2% annualized return. Becton, Dickinson & Company is another one that I've been returning to for put selling. Over the last few months I've opened and closed 2 put options on Becton, Dickinson for a total profit of $149.82. Becton, Dickinson has treated me well thus far so I sold another put option. If Becton, Dickinson & Company's share price declines below $160 then I'll have to buy 100 shares at $160 a piece. Once again though I would get to reduce my cost basis by the $289.95 premium received lowering my per share cost to $157.10. That's around a 4.7% discount to the price shares were trading at when the contract was opened. Becton, Dickinson's fiscal year ends at the end of September and fiscal year 2016's earnings came to $8.59. That puts the trailing P/E at 18.29x. Looking forward to fiscal year 2017's valuation analysts expect $9.48 in earnings from Becton, Dickinson & Company. That puts the forward valuation at 16.57x. The yield on cost at my effective purchase price would be 1.86%. If the share price remains above $160 then the option premium will be kept as profit. Based on the $16,000 of cash required to secure the put option that's a 1.81% return. If held through expiration that would represent a 16.5% annualized return. 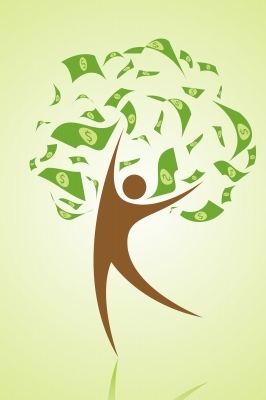 Do you use covered calls or cash secured puts to generate income? Or do you stay away from options completely? Nice to see you going for it right away this year. I really like your VFC put. Getting the stock at $50 would be fantastic. I sold a VFC put last month at $57.50. I'll likely have this contract assigned. But, I'm going to sell another put at $50 soon. I'm in the process of finally moving everything over to Interactive Brokers. The assets are moving now, so I'm in a holding pattern the next few days. Best of luck with these trades. My $55 strike VFC put is likely to be in the money, but if we get a little bit more upside then I'll be faced with the decision of taking the shares at $55 or buying to close the put. I'm not exactly sure which one I prefer just yet because there's always the possibility to just serially sell calls to keep producing income. I guess it comes down to whether I think I can bring in more income via call option premium + dividends + capital appreciation as opposed to put option premium. Maybe calls will be the best route? That will be great to get everything over at IB. Those costs are ridiculously low and that's still one thing that I need to combat. I'm contemplating moving the cash from my primary taxable account to my secondary one because the costs are lower by about 40%. It's not IB low but it's an improvement and gets me moving in the right direction for costs. Like all of these except HAL. Lots of risk in oilfield services space. Hope it works out for you! I need to hold out for a minimum threshold for tax purposes or the shares would already be gone from my portfolio. Due to that I figure selling calls is the best strategy even at the risk of further downside from oil falling back down. I'll be glad to get this one out of my portfolio and free up the cash whenever one of the call options does trigger.